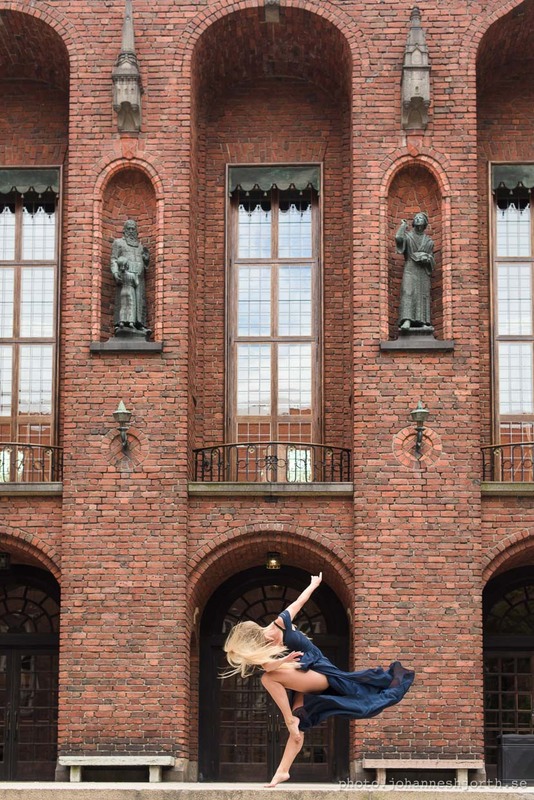 Yesterday I met up with Jacqueline Sogell to do a dance photo shoot. We were also joined by Yasemin Nilsson Altan and Nils Schylström that helped us. 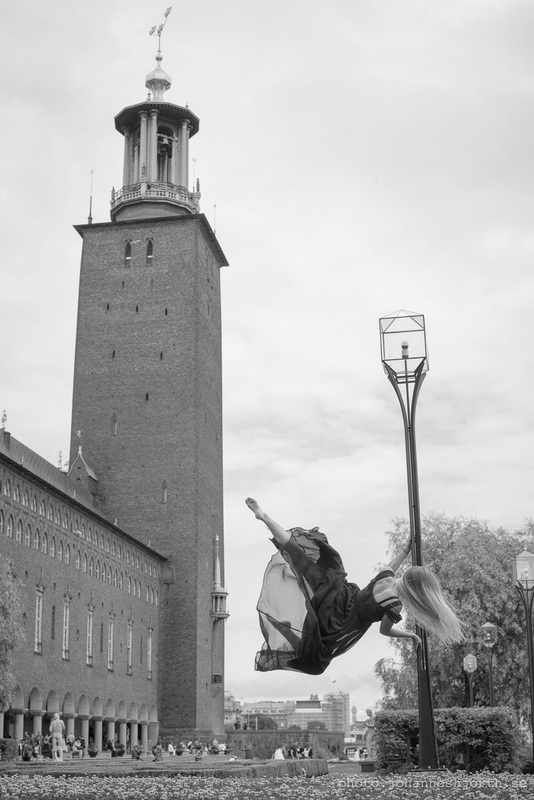 The photo shoot started at the Stockholm City Hall, where we spent the first hour doing some outdoor photos, before moving into an underground garage to do some creative photography that required a bit of darkness. Below are some of my favourite photos from the day. There were a lot of tourists at the Stockholm City Hall, at the far end we found a quiet spot. Here Jacqueline Sogell has climbed up on one of the walls. This gave us a clean background. We moved into the cloisters for the next set of shots. This meant the light only came from one direction, giving us soft but more interesting shadows. Rearranging the skirt, and trying a different pose. A quick snapshot, while trying the light on the other side of the cloisters. A bit of pole dancing. I really like the light and wind in this photo. For me this is probably the best one of the outdoor photos. A bit of backlit magic! Jacqueline liked the brick facade here, so we decided to use it as a backdrop for a few photos. Because of my angle I had to correct for the perspective in Photoshop. After the Stockholm City Hall we took a car to the underground garage. Our plan was to use flash and flour to capture motion. 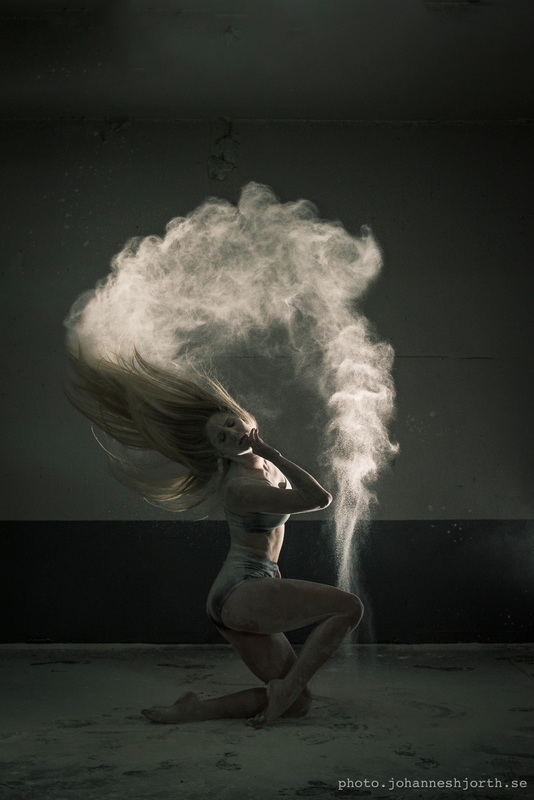 The flash would allow us to freeze the flour in flight, showing the trajectory of the movement. To get more flour in the air we had Yasemin and Nils throw a few fists full of flour behind Jackie before running out of the frame as she did her jump. 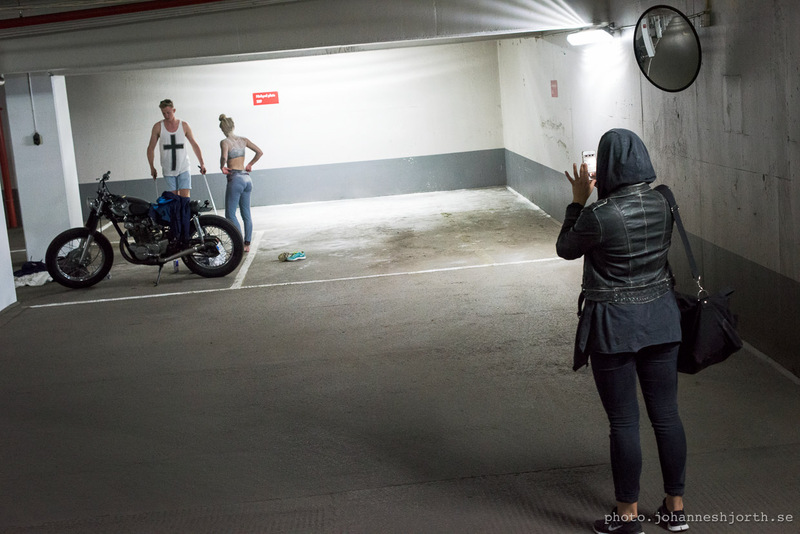 A behind-the-scenes photo with Nils Schylström, Yasemin Nilsson Altan and Jacqueline Sogell. As you can see we are using ordinary wheat flour for the photos. The resulting photo, with the flash held high. We made a bit of a mess. Here Yasemin is helping apply more flour to Jackie’s hair. 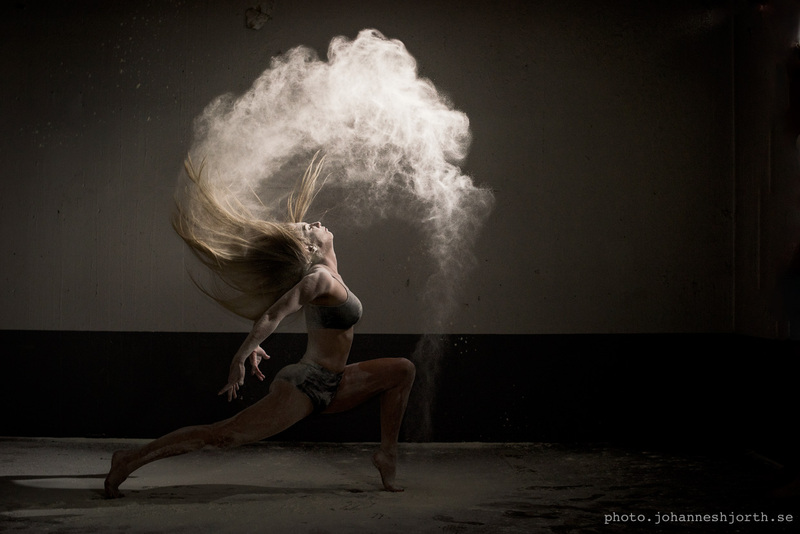 I really like how the flour trails show the motion in these photos. One last jump before we called it a night. We made quite a mess, but I am starting to think that the messier the idea, the better the photos. Flour overload here and another great pose by Jackie. This was a fun and creative photo shoot. Many thanks to Jackie, Yasemin and Nils!